Housing for a family with a childwith a disability should be guided by the Decree of the Government of the Russian Federation from 27.07.96. No. 901, and Federal law № 48, article 4563. The regulations of these laws were approved the rules of providing housing for people with disabilities and families with children with disabilities. In accordance with the measures on social protection of these social groups and aid in their adaptation, each subject of the Federation should do everything to facilitate the provision of housing and other benefits. To a family with a disabled child, put on a preferential queue for social housing, you have to be poor and needing improvement of living conditions. Also put on the waiting list families whose housing does not meet sanitary and hygienic standards, is old and dilapidated or if the family lives in cramped conditions in one apartment with other tenants. For people with disabilities and families with children with disabilities set your standards of living space per person. Determines their each subject of the Russian Federation independently. In turn, you can stand as the place of residence and place of work. The law also allows for a situation where persons with disabilities or families with disabled children will stand in two lines. For registration one must submit an application on a special form, which is issued on the spot. It is necessary to attach the required documents. Need to extract from the house register, statement of account, certificate of disability, copy of the rehabilitation program. If the family has housing, you need to take the extract from the cadastral passport and a copy of the cadastral plan. If a family has enough living space for your stay, the local municipality can assist in the relocation of disabled people from the upper floors of the house on the bottom. 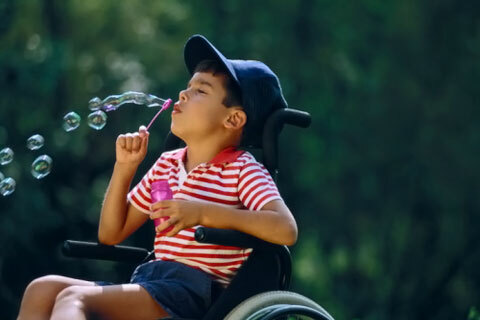 If the disabled person is placed in a state institution for the care and detention, the right to housing remains for 6 months, then it is lost and the apartment transfer to another needy disabled, or families with a childwith a disability. Persons who were brought up in boarding schools for children with disabilities, have the right to housing the queue to 18 years.